Today we harness the power of the cyclone. As a cybernetically created android they’ve always kinda been my thing. Although perhaps my creator could have picked a less ominous color choice for my chassis. 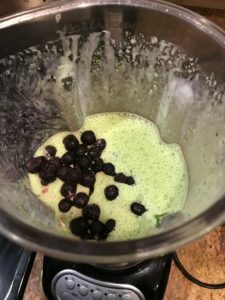 Luckily for you all in addition to my programming to protect the human race harnessing the power of the winds he also gave me this great smoothie recipe to share with you all! 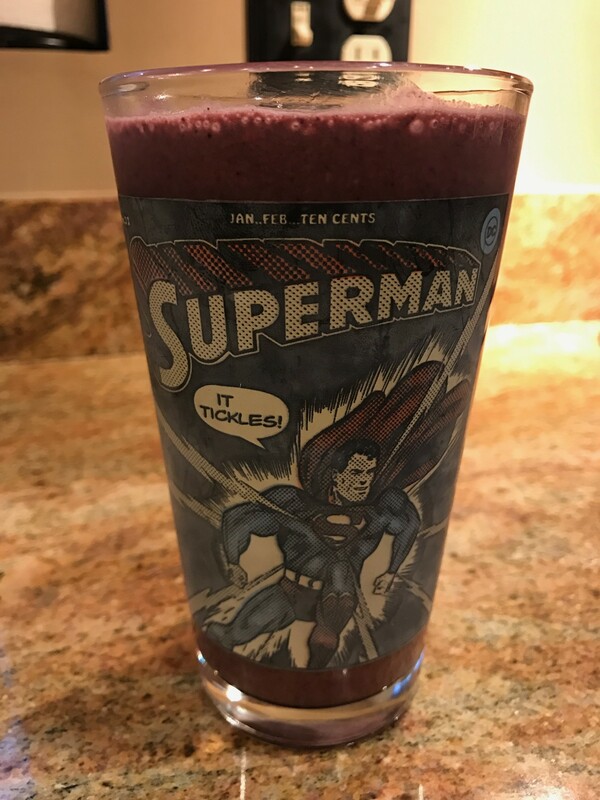 This recipe is for the SuperHuman in need of a post workout drink that can double up as a meal replacement. Friends, I gave myself a challenge here as smoothies are pretty main stream now. Each of the main ingredients used to concoct today’s recipe is a SuperFood in it’s own right. I highly encourage you to eat more of each ingredient in your transformation journey. We will be seeing some old friends (coconut oil, kale) and making some new friends that deserve their own turn in the spot light (blueberries, chia seeds). 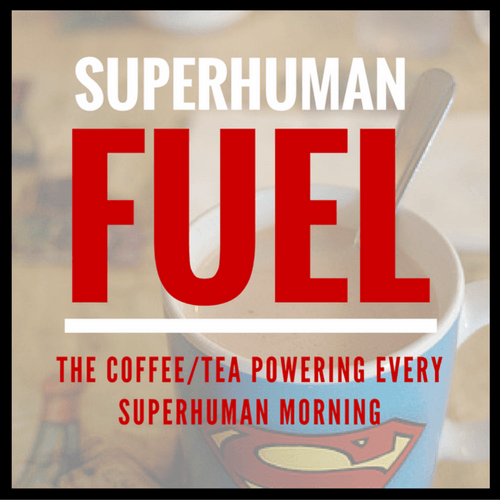 The resulting combination is a calorie dense, nutrient dense, super powered punch. High in iron, calcium, vitamin A and vitamin C, and a healthy dose of protein. Check out some other uses for coconut oil here and here. And another kale feature here. Kefir is a recent addition to my SuperFood arsenal. This probiotic infused dairy is a gift to our tummy’s of Eastern European/Russian/Turkish descent. You would only be partially correct in thinking it’s just like yogurt as they are both fermented milk products but there are a couple of important distinctions. 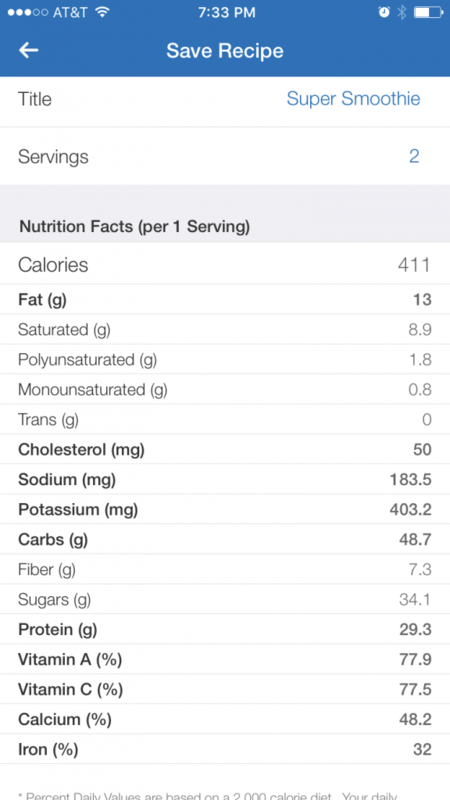 (1) Most yogurts contain approx. 2-7 active probiotics vs. the 20+ active cultures found in milk kefir. (2) Due to the greater number of bacteria cultures in kefir it is 99% lactose free making it lower in sugars and easier to digest. Now onto the health benefits of this milk from the micro-gods. An 8 oz. serving has 8 grams of protein, 22% of your daily calcium, is high in Vitamin D and is high in organic acids and peptides that your body loves. And to really hammer home the probiotic benefits found in kefir, these friendly neighborhood super-bacteria help with digestion, carry some anti-harmful bacteria resistance, and can even help with weight management. 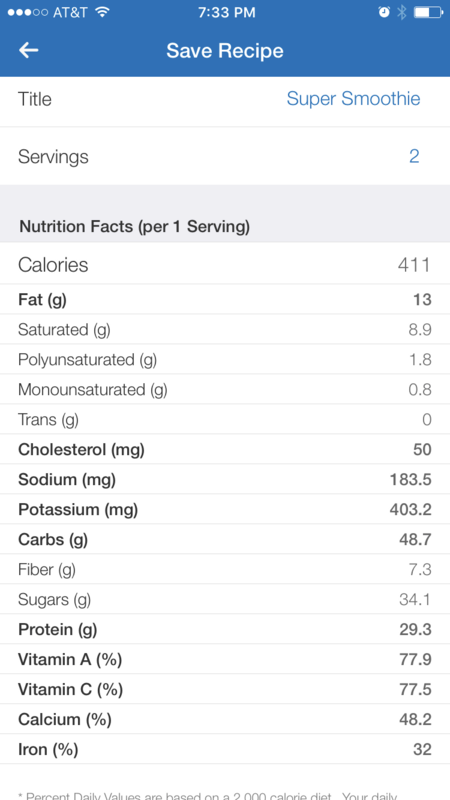 This recipe makes anywhere from 2-4 servings. 2 servings if using as a meal replacement. This recipe meets the standards of our Paleo, Mediterranean, and Vegetarian Pillars. If you are vegan replace the kefir with a vegan friendly option. 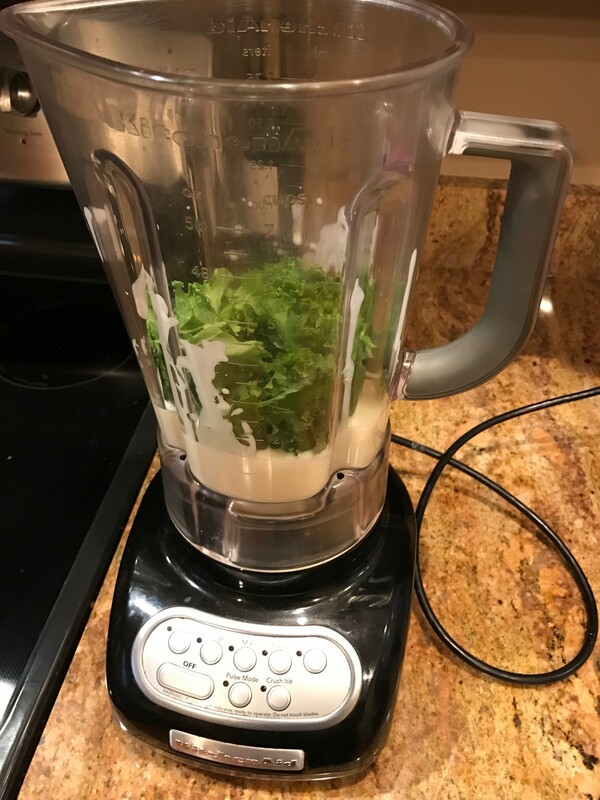 Start by pouring your kefir into the blender, add the kale and coconut oil. Now starting at the lowest speed, and gradually increase the speed (every 5 to 10 seconds). The goal here is not to overwhelm or loose your blue tornado. You are targeting the photo below. If an air bubble captures your blade you will hear a high pitched noise. Turn off your blender use a utensil, pop the bubble and start again. 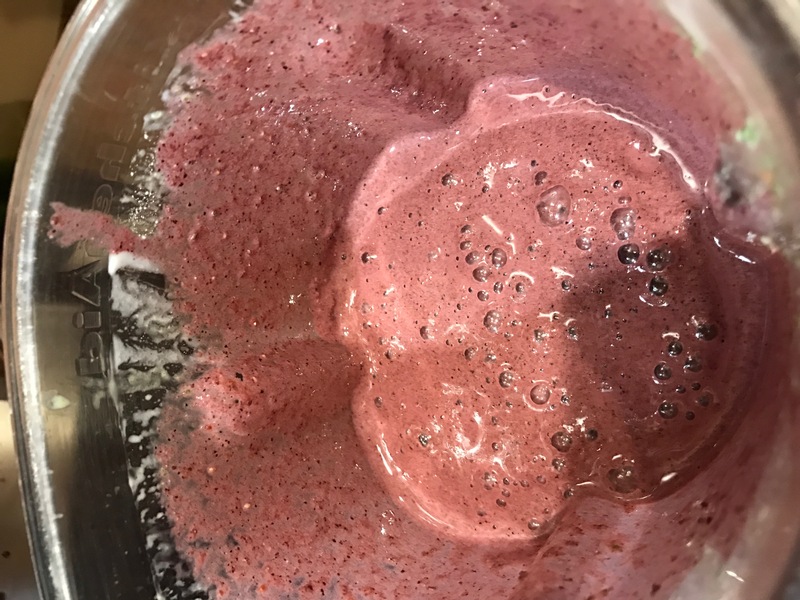 If you are convinced your smoothie is too thick you have two choices (1) wait for the blueberries to slightly defrost more or (2) add a bit more kefir or water and give a quick stir. 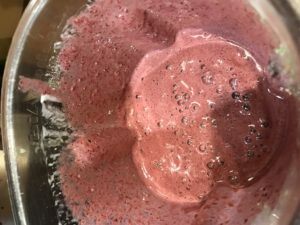 Once you are convinced that your smoothie is free of frozen chunks turn off the motor. Add your protein powder and chia seeds and run the blender again at a medium speed. 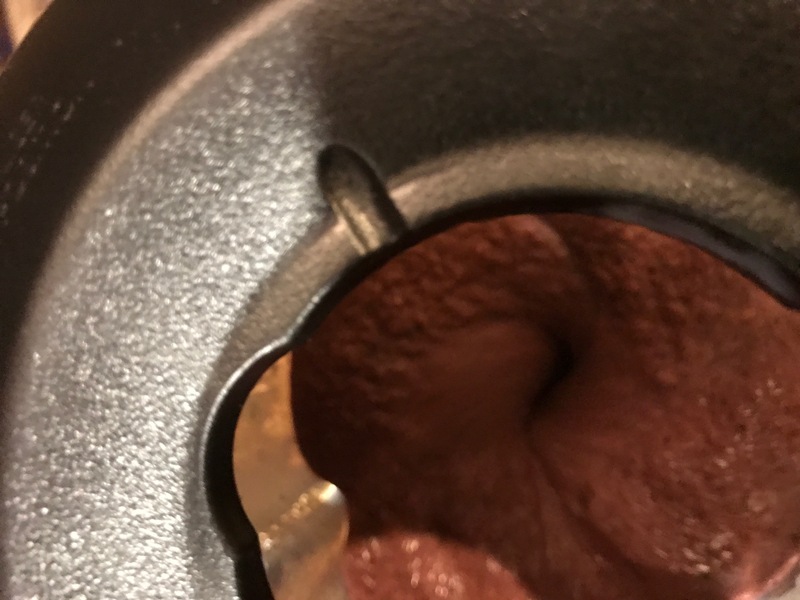 Ensure that the protein powder has fully mixed. 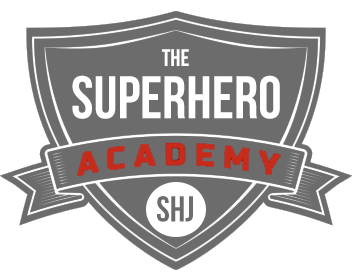 Ready to Transform with Mike and I? !